For batter - Mix all the ingredients, add water and make batter. It should be of thick consistency. Cut slices of bread diagonally to make 2 triangle pieces. Take a bowl. 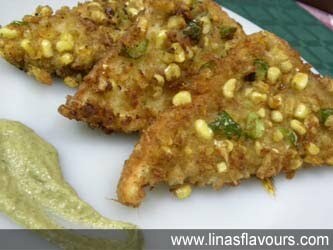 Add corn kernels, bread crumbs, salt, pepper, ginger-garlic paste, green chillies, capsicum and mix it well. Take a flat frying pan and heat oil for frying. Take one triangle piece of bread, dip in batter and roll in corn mixture. Press it slightly with hands on both the sides so that mixture sticks properly. Shallow fry the pakoda in oil. Same way shallow fry all the pakodas in batches. Serve it hot with tomato ketchup or mint-garlic dip.